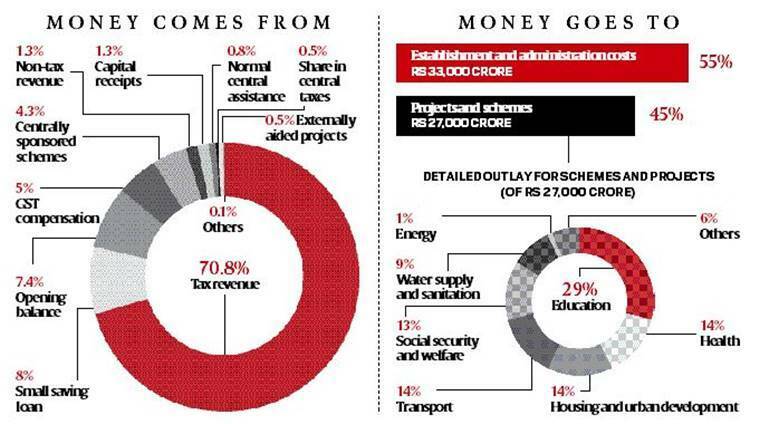 At 26%, lion’s share of budget allocation goes to education. Rs 2,500 for students in classes VII to XII if they score more than 80% in school examinations — one of the key takeaways from the Delhi Budget, presented by Deputy Chief Minister Manish Sisodia in the Assembly Tuesday, is emblematic of the AAP government’s push in education, which got 26% of budgetary allocation. 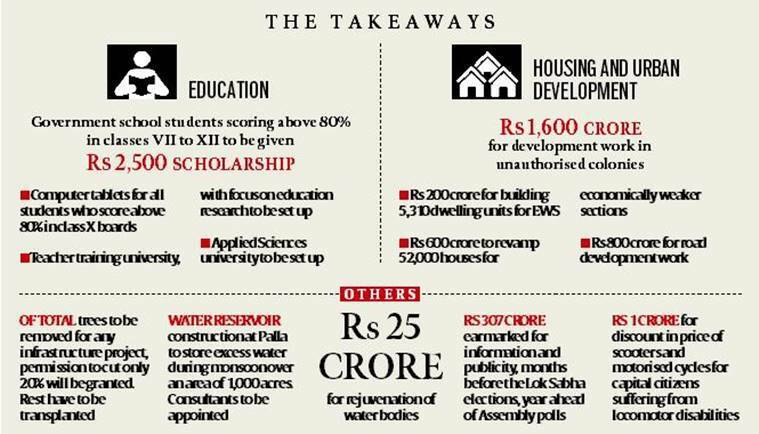 While the Delhi Budget grew to Rs 60,000 crore from Rs 53,000 crore, a sizeable chunk — Rs 15,601 crore to be exact — has been allocated towards school, higher and technical education. Of this, Rs 7,818 crore has been allocated to implement schemes and programmes. A major thrust in the school education section is towards rewarding children’s performance. Under what will be known as the Chief Minister’s scholarship scheme for meritorious students, Rs 2,500 per annum will be transferred to the accounts of class VII-XII students who score more than 80% in the exam, regardless of their family’s income. Apart from this, students who score higher than 80% in their class X CBSE board examinations will receive computer tablets under the Pratibha Fellowship Scheme. Performance in art and culture will also be given monetary encouragement under the fellowship scheme — students who get selected for state- and national-level ‘Kala Utsavs’ will receive Rs 5,000 and Rs 10,000 respectively for “purchase of equipment/apparel”. But what distinguishes the CM’s scholarship scheme from other rewards is that it is purely a monetary incentive. According to Shyam Menon, professor of education at Delhi University’s Central Institute of Education, the move is a step in the right direction. “Rs 2,500 might not mean much, but it can go a long way in giving children recognition for their efforts and achievements. There is usually no focus on government school children, no one to applaud them,” he said. Among new innovations proposed in the budget is a ‘Digital Learning Scheme’, in continuation with the existing provision of computer tablets for all Delhi government school teachers. The scheme is proposed to begin with students in classes XI and XII studying in the government’s resource-rich Rajkiya Pratibha Vikas Vidyalayas and Schools of Excellence. A sum of Rs 9 crore has been allotted for this project. Another new proposal is an addition to the existing School Management Committee fund for teachers to adopt innovative teaching practices. “Teachers can prepare a plan and propose it to the principal. While formal approval of the SMC will be required, the discussion will largely be between teachers and principals. The idea is to allow teachers to implement ideas, without directives from above,” Sisodia, who is also the Education Minister, told The Indian Express.